Gardens and farms on campus boost student health and strengthen academic programs. While one may assume that interest in school gardens arose from the relatively recent increased concern for environmental sustainability, the practice began more than 150 years ago and the idea is even older. According to a comprehensive article on the history of school gardens by Kate Gardener Burt, PhD, RDN, published in the Journal of Hunger & Environmental Nutrition in June 2016, 17th-century philosophers such as John Amos Comenius and Jean-Jacques Rousseau asserted that students could learn important lessons about nature through gardening. By the turn of the century, school gardening was recognized as "valuable for learning geometry (patterns), reading (about caring for plants), and arithmetic (calculating expenses and production value), among other subjects," Burt wrote. She also explains that some scholars believe gardens were a nod to Jeffersonian ideals, "connecting urban youth to their rural, agricultural ancestors and helping immigrant children to assimilate." Gardening embodied a departure from discipline and obedience and promoted individualism, interaction, self-expression, and interpersonal skills such as cooperation. Land grant universities, such as Cornell University in Ithaca, New York, and other schools have long offered agricultural studies and used college farms to help students learn the trades of farming, conservation, animal science, and other subjects. In recent years, however, college farms have gained traction as learning, research, and recreational resources for students, faculty, and community members at colleges nationwide. opportunities to connect with the surrounding community. Interestingly, nutrition and dietetics professionals are relative newcomers to farm involvement at many institutions. 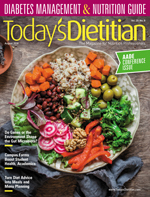 Growing expertise among dietitians at the nexus between nutrition science and sustainable agriculture is paving the way for the profession to become a leader and pioneer in these areas. College campus gardens come in many different shapes and sizes, from small greenhouse experiments to multiple acres of cultivated land. Many farms start small and grow with participation, time, and resources. Colleges don't have to go it alone in developing their own farms. Many operate their farms in partnership with community-based organizations or private organizations. Many also use the help of volunteers and community groups. There are several larger-scale campus farms in the United States that can serve as models for schools that hope to start, grow, or expand their farms. Dietetics faculty and students can learn from these facilities, broaden their programs, and provide hands-on experiences for students. Phyllis Fatzinger McShane, MS, RDN, LD, director of the dietetic internship program at the University of Maryland (UMD), College Park, speaks about the success of her campus' farm and her campus dining services' history of dedication to sustainability. She has worked to integrate the nutrition students' learning into the farm operations. The UMD dietetic internship program is located within the College of Agriculture and Natural Resources, with the farm being a joint project between UMD dining services and the college. UMD dietetic interns spend a two-week rotation in campus dining, focusing on sustainability. They're responsible for organizing a farm festival and a term food day for the campus. Carissa Heine, a 2018 honors graduate from Penn State University in State College, Pennsylvania, with a BS in nutritional science and dietetics, was a student farm pioneer on her campus. As a freshman, she joined the Student Farm Initiative with a few graduate students and a newly hired farm design coordinator. To get the ball rolling on creating a student farm, Heine started an undergraduate farm club in her sophomore year. Heine and her recruits worked hard and grew the club, with members cultivating hydroponic lettuce and herbs for the dining halls; holding numerous sustainability, agriculture, and food systems events each year; and advocating for the future of the farm. Today, the Penn State student farm is a one-acre diversified vegetable farm that uses organic practices. Before she graduated, Heine spent her time "prepping the farm, reforming the beds, starting seeds, transplanting and direct seeding, managing pests, and harvesting and storing the produce." She also worked with a community-supported agriculture program. The farm is currently securing a nine-acre site for expansion. Cornell University's Agricultural Experiment Station is a large-scale operation with a long list of learning and research projects. Cornell's 11 campus area farms manage 325 acres of land in and around the university campus. The farms are home to numerous research projects such as the breeding of popular food crops including corn, small grains, potatoes, and pumpkins. A new project focuses on finding different grasses suitable for biofuels. The farm's "cucurbit" breeding project, which is done in partnership with the Northern Organic Vegetable Improvement Collaborative, produces cucumber, melon, squash, and pepper varieties that demonstrate superior performance in organic growing systems. Other experiments focus on developing new potato varieties adapted to northeastern US weather and ideal for various food products and on breeding fresh market varieties of tomatoes and onions that are disease and pest resistant. The farm also takes its show on the road, participating in local health fairs, farmers' market events, Earth Day celebrations, and more. The farm recently partnered with a Class A baseball affiliate, the Charleston RiverDogs, whose home games now feature information on living a healthful lifestyle, complete with healthful concessions such as tacos made from vegetables grown on the farm. The farm also partners with the MUSC Wellness Center and Lighten Up Charleston, organizations devoted to promoting better health. However, the lion's share of the harvested food is used for teaching children, patients, students, staff, and the greater community about whole foods. Kathleen Carozza, MA, RDN, FAND, director of the dietetic internship program at the College of Saint Elizabeth in Morristown, New Jersey, works with a community-based organization, Grow It Green Morristown, to farm in a greenhouse owned by the college. Carozza says that the hope is to expand this partnership. The college's dietetic interns will begin working with the farming efforts in summer 2019 as part of a new concentration in Community Health and Nutrition. Not far away, Lauren Dinour, DrPH, RD, an assistant professor of nutrition and food studies at Montclair State University in Montclair, New Jersey, says that her campus recently started a community garden where individuals and groups have signed up to care for raised beds. The produce will be donated to the campus food pantry and other pantries in the community. Judith Rodriguez, PhD, RDN, LDN, FADA, a professor at the Brooks College of Health at the University of North Florida in Jacksonville, Florida, reports that her nutrition students do service work in her university's garden, which provides some food for dining services and some for faculty research and student use in foods classes. Her university will be adding a food systems minor this fall, and dietetics students will be working on projects with the garden director. California Polytechnic State University at San Luis Obispo has a larger farm, which Arlene Grant-Holcomb, EdD, RD, director of the didactic program in dietetics, uses for valuable student learning experiences. Her major involvement with the campus farm is a springtime service learning activity in which students in quantity food production class plan, prepare, and serve lunch to about 1,500 admitted students and their parents. She says that the garden activities are a major attraction for prospective students: "Students love to share that not only were the strawberries grown on campus, but students made the fruit salad as part of a class." She posted a YouTube video on this experience, which can be found at https://youtu.be/00FMl-gqJOU. Kristin Wiens, MSc, RDN, LDN, a clinical instructor at the University of Delaware in Newark, teaches a one-credit sustainability and food course that involves hands-on cooking, a tour of the campus farm, and the use of produce grown on the farm. She hopes to expand her program's connections to the farm with the opening of a new demonstration kitchen in the fall. Clancy Cash Harrison, MS, RDN, FAND, of Misericordia University in Shavertown, Pennsylvania, is working with both Penn State and Marywood University (Scranton, Pennsylvania) dietetics students to run FARMU, the campus farm. She plans to use the produce for nutrition outreach programs, including those for low-income children in her county. The use of gardening and farming in education has a long and rich history. Many nutrition and dietetics programs are joining forces interprofessionally with agriculture, environmental studies, agricultural science, and other professions to promote sustainability and wider knowledge about our food system and the importance of healthful food choices. At Pace University in Pleasantville, New York, collaborations are underway between its nutrition and dietetics and environmental studies faculty to research food systems and expand the use of its campus farm. Faculty discuss the value of crossing traditional academic boundaries to provide students with deeper learning experiences. The Inter-institutional Network for Food, Agriculture and Sustainability (INFAS) is a national network of university and college educators whose members are researchers and activists from 25 institutions across 20 states. The organization promotes collaboration for analysis, synthesis, and problem-solving among those who wish to increase food system resilience, illuminate trends, and promote common stewardship of biodiversity and ecosystem services, while reducing inequity and vulnerability in the US food system. Resources are available for those wishing to develop campus farms. INFAS recommends that garden starters also use resources provided by the Sustainable Agriculture Education Association, the USDA National Agriculture Library, and the Association for the Study of Food and Society. Heine explained the value of a campus farm experience: "We all eat food, and as dietitians we study the biochemistry of how food interacts with our bodies. I think that in order to fully understand the body and health, knowing food is important. Experiencing agriculture helps us get to know our food differently and appreciate it more. Knowing more about the entire food system also helps us understand our clients, their food choices, and the factors that influence their choices so we can serve them better." She continues: "Farming opened up a whole new side of food for me that helped me develop my own definition of good food. I have always loved eating food, but farming made me work and sweat and bleed for that food." — Michael H. Finewood, PhD, is an assistant professor for environmental studies and science at Pace University in Pleasantville, New York. 1. Burt KG. A complete history of the social, health and political context of the school gardening movement in the United States: 1840–2014. J Hunger Environ Nutr. 2016;11(3):297-316. 2. Johnson SL. Cultivating integration: urban farming on a medical university campus. Plan Higher Educ. 2013;41(3):11-17.